Pennsylvania Magician Eddy Ray is available for your next company (corporate) banquet, sales meeting, trade show, luncheon etc. Keep in mind that Eddy Ray provides the highest level of professionalism and only performs a CLEAN and FUN show. There is no blue humor, just TONS of audience interaction, amazing mind reading, and cool magic. This type of entertainment and show is more sophisticated for the adult crowd but there is no need to worry if kids are around. Please allow this letter to serve as a recommendation for Eddy Ray and his magic services. The Red Robin restaurant in Hershey was very pleased with the services provided by Eddy and the guests thought he was fanatical as well. His magic tricks are very entertaining for those of all ages. I would definitely consider Eddy as an addition to your party or any entertaining needs. Stand Up Magic Shows – Eddy Ray offers a stand up magic show that can last 30, 45, or 60 minutes. During the Stand Up Show, guests will have their minds read, solid metal forks will bend using only the mind, playing cards will appear and disappear with ease, your guests will interact and become the stars of the show! A perfect blend of amazing magic, comedy, and audience interaction will make any event one to remember! Strolling, Mingle Close-Up Magic – In addition to Magician Eddy Ray’s amazing Stand Up Magic Shows we also offer close-up magic and mind reading! Eddy will be strolling around from group to group performing close-up magic. Watch your guests react in amazement when borrowed objects such as money, rings, and rubber bands are used to create impossible illusions inches from the eyes of your delighted guests! Every small group of people will get their own mini 5-7 minute close-up magic show, then Eddy moves to the next group. This is perfect for banquets, grand openings, special events… anywhere! Add a touch of magic to your event! 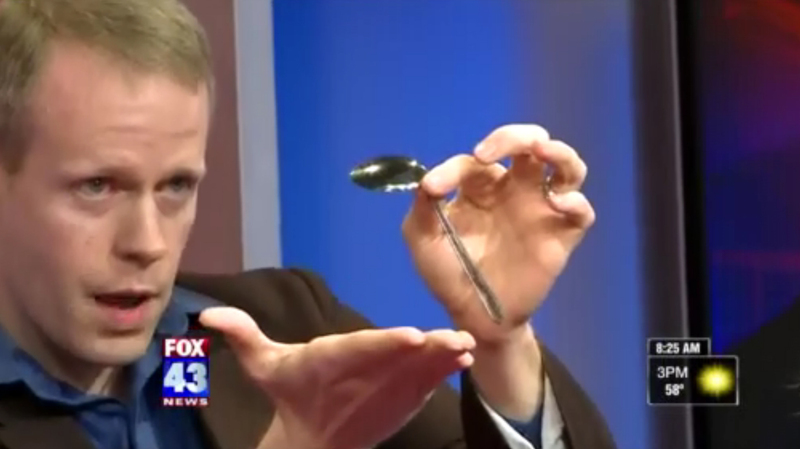 Watch a Brief Magical Preview of Magician Eddy Ray.